BAC, bronchioloalveolar carcinoma; IASLC, International Association for the Study of Lung Cancer; ATS, American Thoracic Society; ERS, European Respiratory Society. ^ Fujita, Masaki; Nakanishi, Yoichi; Shigematsu, Nobuaki (1992). “A Case of Hypertrophic Pulmonary Osteoarthropathy with Bronchogenic Carcinoma.”. Haigan 32 (3): 415–419. doi:10.2482/haigan.32.415. ISSN 1348-9992. ^ a b c d 西條 2011, p. 16. ^ a b c “Epidemiology of lung cancer: ACCP evidence-based clinical practice guidelines (2nd edition)”. Chest 132 (3 Suppl): 29S–55S. (September 2007). doi:10.1378/chest.07-1347. PMID 17873159. ^ “The epidemiology of bronchioloalveolar carcinoma over the past two decades: analysis of the SEER database”. Lung Cancer 45 (2): 137–42. (August 2004). doi:10.1016/j.lungcan.2004.01.019. PMID 15246183. ^ “Prognosis and recurrent patterns in bronchioloalveolar carcinoma”. Chest 118 (4): 940–7. (October 2000). PMID 11035660. ^ Noda K, et al: N Engl J Med 2002; 346: 85-91. ^ Ettinger DS, et al: J Clin Oncol 2010; 28: 2598-2603. ^ Sandler, Alan; Gray, Robert; Perry, Michael C.; Brahmer, Julie; Schiller, Joan H.; Dowlati, Afshin; Lilenbaum, Rogerio; Johnson, David H. (2006-12-14). 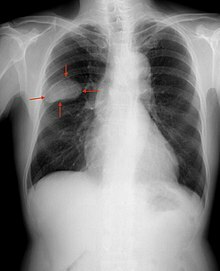 “Paclitaxel–Carboplatin Alone or with Bevacizumab for Non–Small-Cell Lung Cancer”. New England Journal of Medicine 355 (24): 2542–2550. doi:10.1056/NEJMoa061884. ISSN 0028-4793. PMID 17167137. https://doi.org/10.1056/NEJMoa061884. ^ Reck, Martin; Rodríguez-Abreu, Delvys; Robinson, Andrew G.; Hui, Rina; Csőszi, Tibor; Fülöp, Andrea; Gottfried, Maya; Peled, Nir et al. (2016-11-10). “Pembrolizumab versus Chemotherapy for PD-L1–Positive Non–Small-Cell Lung Cancer”. New England Journal of Medicine 375 (19): 1823–1833. doi:10.1056/NEJMoa1606774. ISSN 0028-4793. PMID 27718847. https://doi.org/10.1056/NEJMoa1606774. ^ Gandhi, Leena; Rodríguez-Abreu, Delvys; Gadgeel, Shirish; Esteban, Emilio; Felip, Enriqueta; De Angelis, Flávia; Domine, Manuel; Clingan, Philip et al. (2018-05-31). “Pembrolizumab plus Chemotherapy in Metastatic Non–Small-Cell Lung Cancer”. New England Journal of Medicine 378 (22): 2078–2092. doi:10.1056/NEJMoa1801005. ISSN 0028-4793. PMID 29658856. https://doi.org/10.1056/NEJMoa1801005. ^ Socinski, Mark A.; Jotte, Robert M.; Cappuzzo, Federico; Orlandi, Francisco; Stroyakovskiy, Daniil; Nogami, Naoyuki; Rodríguez-Abreu, Delvys; Moro-Sibilot, Denis et al. (2018-06-14). “Atezolizumab for First-Line Treatment of Metastatic Nonsquamous NSCLC”. New England Journal of Medicine 378 (24): 2288–2301. doi:10.1056/NEJMoa1716948. ISSN 0028-4793. PMID 29863955. https://doi.org/10.1056/NEJMoa1716948.